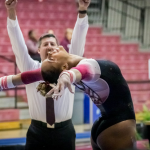 Gymnastics facilities are expensive to build, so it’s not surprising that universities can neglect them in favor of cosmetic upgrades for higher-profile sports. 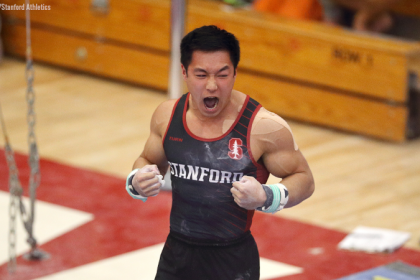 That said, a sleek and well-equipped training gym can be a major selling point for recruiting and certainly can’t hurt athlete morale—but some schools lag further behind than others. Here are six teams we think are overdue for a facility upgrade. The Minnesota men’s training gym is spacious and well equipped, but their balcony looks far more homemade than any balcony should ever look. Someone please build these guys a better place to put their vault. In Berkeley, the men’s and women’s teams share a training gym—and there’s barely space for all of the equipment. The beams are flush against a wall on one end, and vault takes place on a mildly terrifying balcony above the rest of the gym. The facility works, but it looks so chaotic that it’s hard to imagine it functioning well for the athletes. Bowling Green is an odd case—it trains and competes inside a former basketball arena with gymnastics mats laid out on the floor. Many teams compete with gymnastics equipment laid out in a basketball arena, which functions fine, but for a single-purpose gym, it’s probably worth replacing the wood plank floor with something more suitable. The Falcons work hard to fundraise for cosmetic upgrades and updated equipment, but they shouldn’t have to scrounge for basic needs like a new plain blue floor carpet. UMD lags behind the rest of the Big Ten in terms of equipment, decoration and that super bizarre wall of windows. The Terps are well-equipped in terms of training gear, and might even lead the NCAA in in-ground Eurotramps (four of them!). This space just needs to be brought into the 21st century, but unfortunately it’s likely not a priority for the Maryland athletics department at the moment. 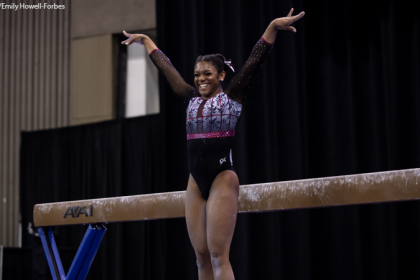 2017 Beam Halloween Intrasquad Highlights!! The Huskies’ training gym is tiny compared to many of its Pac-12 competitors, meaning that most of its limited amenities are semi-permanently covered by mats. It could also use some cosmetic upgrades, including a floor carpet that’s a less brown shade of purple. The biggest problem with this gym, though, is its bizarrely purplish and permanently flickering fluorescent lights. 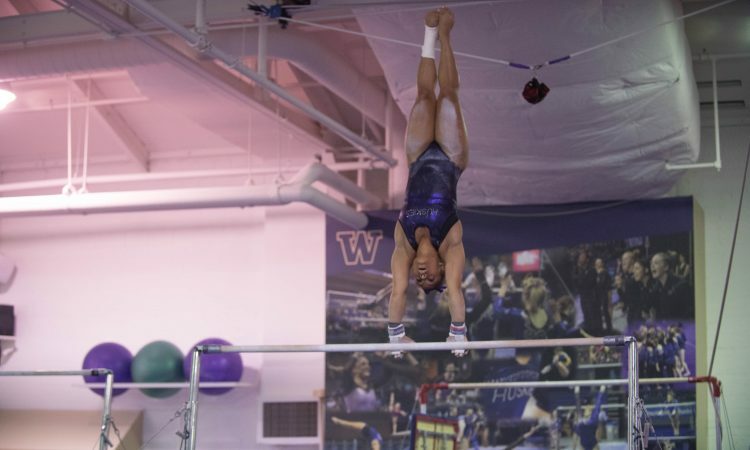 The odd lighting is ubiquitous in the Huskies’ training videos, and when two CGN contributors visited last year for Washington’s annual Meet the GymDawgs event, it left us feeling dizzy and with lasting headaches—hardly an ideal training environment. UCLA’s iconic Yates Gym is in no sense a poor facility, but it doesn’t compare to the stunning bespoke training gyms of the Bruins’ closest rivals, including Utah, Oklahoma, Florida and LSU. In comparison to the top tier schools, UCLA lacks modern and team-branded equipment and mats, specialized training equipment, modern decor and most of all space. Luckily, it doesn’t seem to be hurting the Bruins’ consistently exceptional recruiting. Several high-profile NCAA teams, as well as many MAG club teams, don’t have a training gym on campus at all, instead commuting to a club gym off campus that has agreed to host the team. While these teams often develop a strong rapport with their host club and can be a huge source of inspiration for younger gymnasts, they really deserve on-campus training facilities to eliminate the need for a commute that can be as much as fifteen miles each day. Make sure you’re following us on Twitter and Instagram to stay up to date as we head into collegiate preseason! 1. If I were a Cal gymnast slated to do all around I’d ask if I could drop vault. It looks like if you go off center on vault you’ll go flying off the balcony. 2. I don’t think Maryland’s facility looks that bad? I mean it certainly doesn’t look great, but it looks like the equipment is adequate enough for collegiate gymnastics. 3. While UCLAs facility is fine, it isn’t up to par with Florida, Utah and Oklahoma, and no gym in the country can hold a candle to the palace of a gym that is LSU. But UCLA can probably have like a torn up mat for floor, uneven Bars from the 80s, two beams and an old horse vault and still pull in somewhat decent recruits because of the lure of LA. People are much more likely to go to a big city near the ocean then they are to a college town that is otherwise far away from civilization like Oklahoma, and LA is much more renowned than Baton Rouge or Salt Lake City. omg, those vaulting platforms at MN and Cal look terrifying!! Nebraska is getting a new facility! FYI…the photo of BGSU is not their training gym (Anderson Arena). That’s actually the new arena (Stroh Center) that’s used mainly for basketball/volleyball, but also gets set up for big gym meets (like MACs). I haven’t been in Anderson in years, but it’s gymnastics-specific, and has more training surfaces/equipment than what that photo portrays. Still – an upgrade would be nice! !